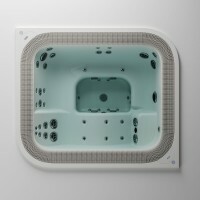 Combining the best elements of the current J300TM and J400TM series Jacuzzi® Hot Tubs, the J-LX® offers several features to enhance comfort including redesigned pillows, improved ease of entry with multi-tier cool down seat, and smarter jet placement for a vigorous and luxurious hydro-massage, whilst the underwater diverters make it easy and convenient to adjust jet flow. With J-LXL®, thanks to 36 adjustable Power Pro® jets, it's possible to enjoy the wellness of a complete Jacuzzi® hydromassage with six seats. It boasts a filtering system with ProClearTM technology and, just like all the other Jacuzzi® spas, it's also provided with the CLEARRAY® device for perpetually clean and sanitized water. Thanks to a protective coating that is about 4cm thick and to its TrifusionTM structure, its heat insulation is the most efficient of the category. A flat deck top without visible acrylic parts and the steel details in the outer corners give it a more contemporary appeal. From its design to its features, everything about this Spa is consistent with its highest energy efficiency rating. ENERGY EFFICIENT WITH LOUNGE SEAT..
Jacuzzi® presents VIRTUS™, A versatile and cutting-edge spa that meets the needs of both private and professional users, with energy savings, easy maintenance and low running costs. With the added value of Jacuzzi® Italian design and technology. VIRTUS™ is a large hot tub – 250 x 215 cm – that can comfortably accommodate up to six people. The inner shell appears moulded by water into soft and enveloping lines and guarantees an effective and complete wellness experience. The seats, with different inclination and depth, are designed to give a hydrotherapy massage targeted to specific body areas from head to toe. VIRTUS™ is the first freestanding spa with integrated compensation tanks and polymer filter – those characteristics make the installation easier, without dedicated technical compartments plus, the overflow and the automatic refill keep the water at the perfect level. Available with electric heater, heat exchanger or heat pump Jacuzzi® EcoHeat™, VIRTUS™ is the best solution for energy saving. Moreover VIRTUS™ can be equipped with the cooling pump Jacuzzi® CoolPower™ that cools the water down to 10°, even in the hottest days. Inspired by Nautilus, the shell has a spiral shape that drains the water quickly and completely, avoiding stagnation. The best combination of hydrotherapy and design..